Kích thước bản xem trước PNG này của tập tin SVG: 192×192 điểm ảnh. Các độ phân giải khác: 240×240 điểm ảnh | 480×480 điểm ảnh | 600×600 điểm ảnh | 768×768 điểm ảnh | 1.024×1.024 điểm ảnh. 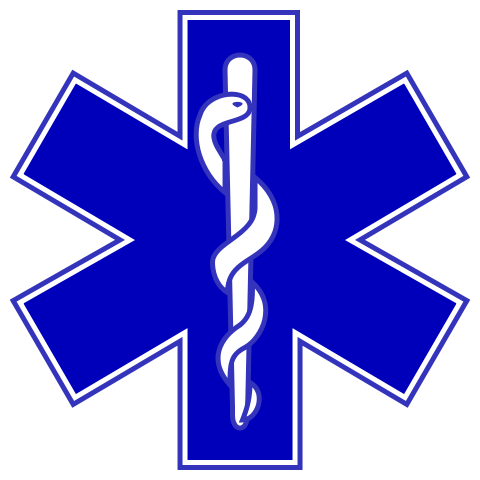 Star of life, blue version. 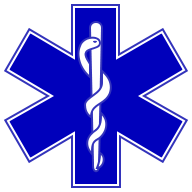 Represents the Rod of Asclepius, with a snake around it, on a 6-branch star shaped as the cross of 3 thick 3:1 rectangles. The logo is basically unicolor, most often a slate or medium blue, but this design uses a slightly lighter shade of blue for the outer outline of the cross, and the outlines of the rod and of the snake. The background is transparent (but the star includes a small inner plain white outline). This makes this image usable and visible on any background, including blue. The light shade of color for the outlines makes the form more visible at smaller resolutions, so that the image can easily be used as an icon. This SVG file was manually created to specify alignments, to use only integers at the core 192x192 size, to get smooth curves on connection points (without any angle), to make a perfect logo centered in a exact square, to use a more precise geometry for the star and to use slate blue color with slightly lighter outlines on the cross, the rod and snake. Finally, the SVG file is clean and contains no unnecessary XML elements or attributes, CSS styles or transforms that are usually added silently by common SVG editors (like Sodipodi or Inkscape) and that just pollute the final document, so it just needs the core SVG elements for the rendering. This is why its file size is so small. (c) 2006 Philippe Verdy, France. (this attribution author notice is required by french law, my country, and designates the XML/SVG work, not the logo design itself). hiện tại 03:28, ngày 16 tháng 9 năm 2010 192×192 (1 kB) Zeus Cleaned up bottom-left edge of staff, wasn't a smooth curve.